I got to know about LDC through the Internet. I was assigned to a very good and patient driving instructor; Steve. I had been driving around on an International driving licence and he knew exactly what areas we should work on. Never in a hurry to finish a lesson. Very kindly Steve used to go on with the class until we were done on that subject. Very very happy to join LDC to pass my test. All thanks to Steve! 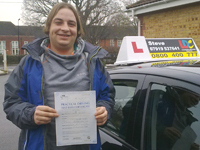 I will definitely recommend Steve to people who are new to driving or nervous about driving. Steve's teaching was 100% (really good) giving many tips to me. Steve was very calm even when i made mistakes. he made me confident to go for the test. The Driving Skills DVD was really helpful and the driving Skills workbook was very useful so I was able to recap each lesson when I got home. This was my third test (the first with Steve). It was my greatest achievement ever! I would recommend Steve to anyone wanting to learn to drive especially those with little confidence. A big "Thank You" to Steve. I had many lessons in London before and felt very un-confident in my driving ability.then I had lessons with Steve and it built up my confidence. He was always very calm and helpful and always made me feel like I could pass. I would highly recommend Steve as a driving instructor. The Driving Skills DVD and workbook was very helpful and gave me a chance to recap what I had done in my lessons. Delighted today when I passed my driving test with no faults! Steve was good with his explanations and clearly explained where I was going wrong. Lessons were conducted in a friendly manner and at all times, Steve was very calm even when I made mistakes. The Driving Skills workbook was clearly laid out and easy to understand and the Driving Skills DVD worked well and prepared me for each lesson. I found the Driving skills DVD and workbook very useful and I passed after I looked through it again just before my test. Thought Steve was very relaxed and calm and he didn't panic. When I did something wrong, he just told me in a nice manner which kept me calm. His instructions were absolutely brilliant and I couldn't fault him in any way. He got me and my girlfriend through the test. I recommend Steve to everyone learning to drive because of the relaxed manner of the lessons and he is easy to understand. Best driving instructor I ever had! Thanks to Steve, I have had a superb driving experience and I cannot thank him enough. 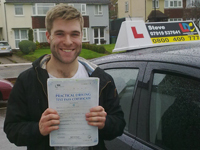 If you want to pass your driving test, book your lessons with Steve.. I found his teaching style and patience very beneficial and encouraging. 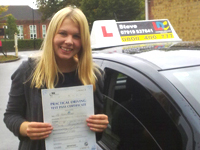 My confidence with driving increased rapidly due to the comfortable environment; I was welcomed in to every lesson. The Driving Skills DVD and workbook was also extremely helpful when preparing and revising for a lesson. I would recommend LDC and Steve to anyone wishing to learn to drive. It is a brilliant investment and a privilege to be taught by Steve. I had been with several instructors before I started with LDC and Steve. I did not get on with my other instructors but Steve made me feel less nervous and helped me really good. I had 12 hours driving with Steve and would recommend him to everyone. He is patient and goes through everything you need to know in detail with no pressure and at your own pace. He uses the LDC Driving Skills workbook which I have never come across before but found it very useful, helpful and very clear. He goes through a section at a time and ticks off the targets when you can do those things. I first came to Steve after 2 years of not driving and was very anxious. After the first session it all came back and Steve's methods were extremely helpful to drivers like me who lack confidence. He will always tell you when you've done something wrong, but will do it in a way that that really makes you want try it again and get better. Also, the Driving Skills workbook that he gave me was extremely helpful, especially with manoeuvres. Overall, I felt very comfortable with Steve and would highly recommend him. After failing my test four times, I decided to change instructor and do a crash course. I found LDC and thought I'd give them a try. What a good decision that was! When you do the course you're given a DVD and workbook which acts as background information and always keeps you up to date and on track. These were really helpful, even for someone with all my previous knowledge. It's really good for reinforcing what you already know. Steve's teaching style is superb, with one on one coaching and he conducts it in stages. I found the lesson targets at the end of each session made learning a lot easier. 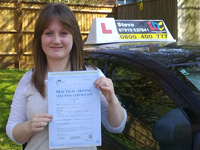 I would definitely recommend Steve and LDC to anyone struggling with driving as it really does help! Best day of my life; such an accomplishment. I couldn't recommend Steve highly enough! I started driving with Steve after several years of not having the confidence to drive. At 17 I had several lessons with another instructor but my confidence was severely knocked. The instructor convinced me that driving was something I would never be able to do, or at the very most only in an automatic. I finally approached Steve at LDC after reading reviews on his website. Overall my experience was good. Steve was very calm (most people describe their instructor as angry and shouting) and the lessons were carried out in a relaxed manner. I initially took a 30 hour course spread over 2 weeks. This was set out well. When things didn't go too well, Steve suggested some extra hours and this helped me. The Driving Skills DVD and workbook definitely helped to lay down the basic foundation. After going out with Steve to practice, I went back to the DVD and book and this improved my knowledge as I could relate what was shown in the DVD and book to what I actually did in my practical lessons. I have already recommended Steve to some of my friends and will continue to do so. Finally I passed my test with a good instructor. Steve was very calm and put me at ease and explained everything slowly and clearly so I could understand it. The LDC Driving Skills DVD was brilliant and very helpful and the Driving Skills workbook was written clearly with simple diagrams and this was crucial to my learning. I recommend Steve to anyone wanting to learn to drive. I have been learning to drive for over 2 years and had completed over 100 hours. I never really felt I was making much progress at the end. I was taking a 2 hour lesson every week but my confidence was getting low because I couldn't see any progress. I decided that an intensive course might boost me over the edge. I was really nervous and dreading it for months. But it was really good to do it on an intensive basis because it means that you are focussed intensely for a few days and you have ample time to cover everything. (I did 15 hours over four days). The Driving Skills DVD is quite clear and informative and is not overwhelming. I shall be recommending Steve to my brother and other friends in the Hampshire area. 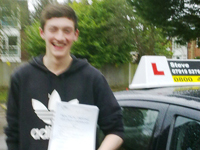 I took my theory test on my 17th birthday and I had booked my first lesson with Steve for the day after. I already had a forklift licence and tractor too, which when I spoke to Steve he recommended 20 hours then the test. The LDC Driving Skills DVD and workbook give you a head start before your first lesson to make more driving time and practice when in the car. I would recommend Steve to anyone. His kind nature and patience is brilliant especially with all my bad habits from driving a tractor. 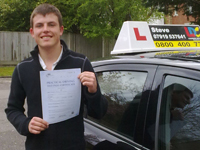 I would definitely say if you want to pass first time, learn with Steve! Nicest bloke I've ever met. Before I started with Steve I had roughly 10 lessons with another school. I found their way of teaching quite abrupt. I started lessons with Steve soon after and within the first hour I felt a lot more comfortable as his ways of teaching were a lot more relaxing. I did 31 hours with Steve and I found him to be very patient and understanding which made me feel a lot more relaxed. This helped as I was a nervous driver already. The LDC Driving Skills DVD and workbook were fantastic as the videos were to the point and it was done lesson by lesson which helped with my practice. The LDC workbook was structured the same way as the DVD so helped consolidate my knowledge and helped with the practical lesson that followed and with the test. I really recommend Steve because of his patience and understanding of my needs. I arranged a semi-intensive course just after my 17th birthday. I found having a 2 hour session twice a week really helped to get my confidence up as I was very nervous at the start. I passed my theory test first time a month after my birthday. I found the LDC theory book and DVD really useful to learn all the questions and practice hazard perception. The LDC Driving Skills DVD and workbook helped to start the lessons as I knew what I'd be doing and roughly how to do it. The questions and marking off the targets for each lesson helped me to gain confidence as I had to rate myself. I have found Steve has been very patient with me and understanding of my needs. 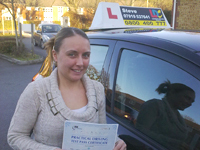 I have really enjoyed learning to drive and would recommend Steve to any learner drivers. I took a 15 hour Test Booster Course with Steve. Before I started the course I was given a Driving Skills DVD and workbook. I found these both to be extremely helpful. Especially the DVD which takes you through everything step by step and you can correspond this with the lessons. 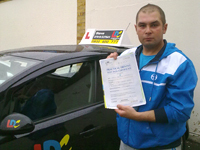 I would like to say how I passed my test FIRST time and found Steve's way of teaching very easy and understanding. Within the first day my driving skills had progressed no end and it just kept improving. I would like to strongly recommend LDC system and Steve's method of teaching to anyone who wants to pass quickly and easily. All I can say is if you want to pass with ease, learn with Steve. Following my success in my driving test, Steve suggested that I took a Pass Plus course with him. I have just completed this course and I have found Steve's way of teaching very useful and enjoyable. 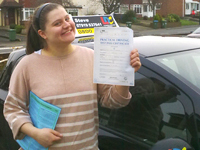 The course is not as intense, as you already have your full driving licence. 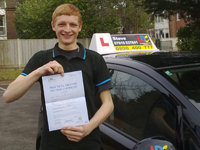 However, it has allowed me to develop my driving skills and make me a much better and safer driver. I strongly recommend this course to anyone who has recently passed. Steve was a great instructor. Together with the LDC system he broke the tuition down into manageable sections so that every aspect was covered. 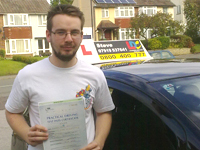 Always friendly and approachable, Steve had a very logical way of teaching which undoubtedly was the reason I passed. Steve would constantly be asking questions and getting me to think about what I was doing and how it all tied in together. Any specific areas of difficulty again Steve would break down bit by bit to help me to get to a standard to pass. 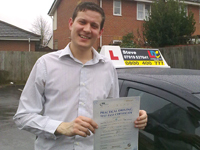 I would recommend Steve to anyone; first time drivers or those looking for a bit of help to reach a standard to pass. I am now looking to do Pass Plus with Steve. 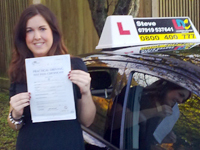 I'd never driven a car before my lessons with Steve and I was nervous when I first started. Steve is prompt for lessons, understanding and always encouraging. Steve took things at a pace I could handle. The LDC system (DVDs and the workbook) gave me a good structure and a set of goals to work to. I passed first time which says it all really. I would recommend Steve and the LDC method to anyone especially nervous drivers. I am now looking forward to taking Pass Plus with Steve. I had taken my test twice before and failed. This time I booked an intensive course of 15 hours (Test Booster course). The block driving was a great help as you immerse yourself in driving. The DVD and workbook were a great help because they took you through the lesson bit by bit and this helps the information stick in your mind. Steve's style of teaching was great being very clear. Steve put me at ease and talked me through everything until I was confident to do everything with high proficiency and on to a successful test with only 5 driving faults. All in all, the LDC method is a great way to learn how to drive. Steve was very approachable and would answer any question or query I had. He was very supportive when I was about to start my test which filled me with confidence. I enjoyed my driving lessons. I strongly recommend Steve to anyone who wishes to pass driving quickly and anyone who has struggled with other instructors. I had taken lessons prior to going out with Steve and I lacked confidence in my ability. Steve built my confidence up over the course of the lessons I took with him. I found the LDC method - watching the DVD showing each lesson and working through the section in the workbook really helpful. When Steve took me out for each lesson I felt prepared and didn't waste any time. Steve's way of teaching was really helpful and when I made mistakes we were able to laugh about it. I was always looking forward to my lessons with Steve. 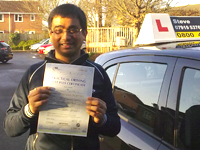 With Steve's help, I passed first time with 7 driver faults. I would strongly recommend Steve and the LDC method to anyone that wants to learn to drive. I opted to complete the intense 1 week course and found the DVD's and Workbook an invaluable set of tools to complement the the programme run by my instructor Steve. Steve's instruction style was brilliant and exactly what i was looking for to make my learning a lot easier and without a doubt was a factor in my pass success at the end of the week. Many thanks Steve. My success is down to you. The "Driving Test Complete" DVD was useful because it explained each answer as well as having practice tests, which helped me to understand. The hazard perception was useful as you could see the scoring window so knew what you were doing, as well as having a wide range of practice clips. If I hadn't used this disk, I don't think I'd have passed the theory test first time. I had already failed my theory test once when I purchased the "Driving Test Complete" DVD and theory workbook from Steve. I had little confidence with the Hazard Perception, but when I practiced the clips on the DVD this showed me where I had clicked and where the scoring window actually was. This helped me to click at the appropriate time. I felt I learned a lot from using the clips and I found it fun too! The 400+ clips that I practiced ensured I passed the theory test on my next attempt. I would recommend Steve and the LDC system to everyone who is about to learn. The Driving Test Complete DVD set was essential to me passing my theory test. The questions and the hazard perception clips in particular were brilliant. 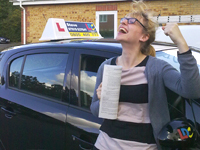 After studying the DVD and the Theory Test Workbook I felt confident going into the test. 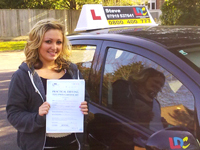 It genuinely helped to increase my confidence and awareness of practical driving as well. I passed my theory test comfortably first time as a direct result of the DVD and workbook. 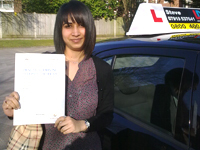 I had been struggling with my driving for quite a while, failed my test on two occasions and didn't feel I was making much progress with my lessons. I had been having lessons with my instructor for well over a year and it just felt like I was going round in circles without moving forward. I didn't feel as comfortable as I wanted with my driving and didn't think I was making any improvements. So I decided to start having additional lessons with Steve Palman as well as lessons with my other instructor. 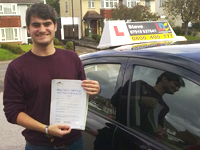 Steve gave a new dimension to my driving lessons and helped me overcome the things I had previously struggled with. 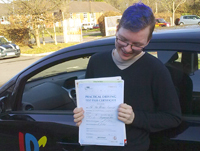 As a result I gained a lot more confidence with both my general driving and performing manoeuvres and I feel that my driving ability greatly improved. After only a few short lessons with Steve I felt I was able to take my test, and passed! I would highly recommend Steve to anyone wishing to take up driving.